The newest arrivals in America are assimilating faster into the society than previous generations, and their experiences don’t fit into the most common stereotypes leveled against them, according to a National Academies of Sciences, Engineering and Medicine report published this week. This material “New Study Demolishes 3 Pernicious Myths About First-Generation Immigrants In America” was published by ThinkProgress. Read the full September 24, 2015, article by Esther Yu-Hsi Lee, the Immigration Reporter for ThinkProgress, on their website. On Thursday, September 23, 2010, Grand Canyon National Park in coordination with The Department of Homeland Security, hosted a naturalization ceremony at the Mather Amphitheatre on the South Rim. This is the first time in history that Grand Canyon National Park has hosted such an event. Under blue skies and before a breathtaking view, 23 individuals from 12 different countries including, Colombia, Dominican Republic, Guatemala, Japan, Mexico, Morocco, Australia, Trinidad and Tobago, Uruguay, Venezuela, Vietnam and Zambia, became naturalized citizens. Many family members and close friends of the candidates came to show their support for this special event. 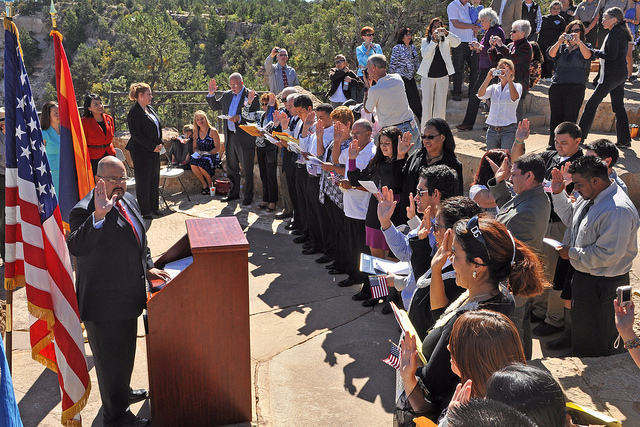 Park employees and visitors also watched on as the candidates stated the Oath of Allegiance, and received their certificates of naturalization. This event is part of USCISs annual celebration of Constitution Day and Citizenship Day. An estimated 9,258 candidates became citizens at 63 special ceremonies held across the country and around the world from September 13-24, 2010. Constitution Day is celebrated on Sept. 17 in remembrance of the signing of the Constitution in 1787. Since 1952, Citizenship Day has been celebrated in conjunction with Constitution Day.